The CoffeeShop Blog: CoffeeShop Cropping Tip! 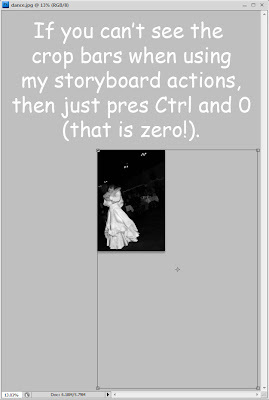 If you use my storyboard actions that automatically crop your image, there might be times you can't see the crop bars and so you aren't able to drag them to fit your image. This is because your image is smaller in pixel size than the image I used to write the action. Well, don't be frustrated! There is a simple solution in both Photoshop and Photoshop Elements. This trick also works when you are not using my actions. This trick has saved me so much frustration and I wanted to share it with you. I am enjoying your site. Wishing I had PSE so badly but sometimes I can use the information in my program it's just not as good. I have been bugging my hubby to get an external hard drive too. It would help with all my digital stuff.